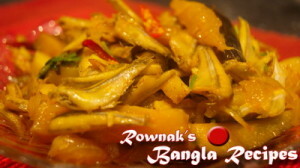 Am Begune Mola Mach (Sour Eggplant with Small Fish) is very traditional fish with green mango during Summer. You can use mustard paste in this curry. Please don’t forget to join my facebook group or like my facebook page to keep in touch with me .Thanks. 1. Cut the fish and clean the fish a few times with water and salt. Place the fish in a strainer. 2. Cut eggplant and potato like the picture. Wash them and keep aside. 3. Cut green mango in same size. 4. Heat oil in a pan and add slice onion. Fry it till becomes transparent. 5. Add chilli powder, turmeric powder, garlic, bay leaf, ¾ teaspoon salt and 1 tablespoon water. Stir it and cook it till oil comes out. 6. 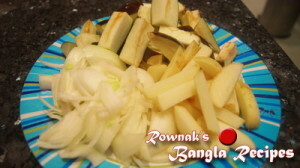 Add potato and egg plant and stir it. 7. 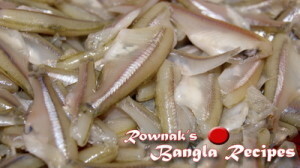 Cook it for 5 minutes and add fish, mango pieces, green chillies and 1 and ¾ cups water. Cook it under closed lid till water dries up and all ingredients cook thoroughly. 8. Add coriander leaves and check the salt. Remove it from heat. 9. 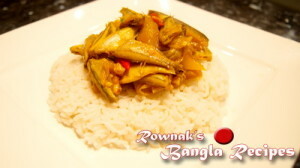 Serve Am Begune Mola Mach (Sour Eggplant with Small Fish) with plain rice.